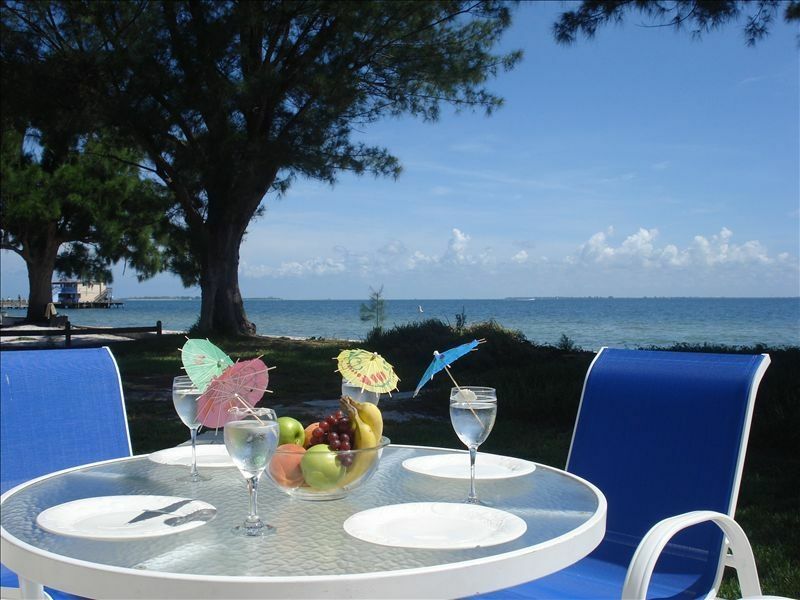 Beautiful waterfront home located on the north end of Anna Maria Island. Located on North Shore Drive, approx 9 houses east of the Rod n Reel Pier and half a mile from the Historical City Pier. Anna Maria Island is a piece of old Florida. Perfect for family vacations, swimming, and watching the dolphins. 100 ft of private beach is all yours! Relax on the large back deck as you watch the waves and dolphins. This waterfront property is an ideal location that is walking distance to restaurants, the Gulf beaches quaint ice cream shops and so much more. You can rent bikes, golf carts, and other essential island equipment nearby on Pine Ave. The garage is stocked with floaters and other beach gear as well. Nice easy beach with a calm sandbar - perfect for little children. We enjoy the pine tree in the back which offers shade for those who are sun sensitive and yet still want to be part of the action. The home features two bedrooms with king beds, one bedroom with a queen bed, and one bedroom with two twin beds. Please note that this house is not available for wedding receptions or other parties. This is our second year on Anna Maria and first stay at this lovely home. We LOVE Anna Maria especially this area of the island. It was clean and if we had any issues they were addressed within a day. The house has just been remodeled and it was up to date and looked good and was comfortable. The only draw back I would suggest is the bathroom off to the side has no shower/bath it is just a half bath but the other two have a shower so those can be used. The kitchen was well stocked and clean. Beach access is wonderful with a nice shade tree while sitting on the beach. We would definitely stay here again !!!!!! This was our second stay at the house and their care and attention is evident, The deck furniture had been replaced since last year. We enjoy staying here so much. Even during the hottest Florida days, the shade of the trees in the back combined with the breeze off the bay make this such an enjoyable spot to just sit and talk while watching dolphins or an occasional manatee. It is very well situated within walking distance to either pier. Sunsets at Bean point should not be missed. It takes 5-10 minutes to stroll to Bean Point. The house is very clean and well maintained. The decorations are very nice and tastefully done in a fun beach style. This is our second year here and have already booked next year. Great place for families. We had another amazing stay at 901 North Shore. Our family has stayed in this home for years. The location is perfect! Easy walking distance to all the local favorites. The backyard is literally the ocean. We sit on the deck watching the manatees, seagulls, and especially the dolphins. This was our first year since a complete remodel. The home was lovely before, but now, WOW! Upgrades throughout. I can't recommend it enough. We will continue to come back year after year. This house was great for two families. We had plenty of room and privacy. We had 4 kids under 5 and they enjoyed playing in the water and looking for seashells while the adults could drink coffee or a cocktail from the porch. Close walking distance to downtown and shopping. The kids enjoyed having their own space in a separate area to watch tv and play games while the adults hung out in the living room. Great detail in decor, big cozy beds, lots of charm. I appreciated the vintage pink bathroom. Upon arrival the backyard had pine needles everywhere. The patio was dirty and you could not see the path leading down to the beach due to all the needles. My husband spent an hour sweeping and cleaning, doesnt that scream vacation? There were a few ant hills with ants crawling everywhere and biting the kids. There's a great large lawn but don't bother laying out or trying to walk or play on it. It was overgrown and had a ton of small spikey balls from the tree. Very disappointing. I was also shocked that the cleaning crew literally gives you ONE dishwasher pack, ONE trashbag and that's it. If you pay for a week there should should be a weeks worth of supplies. I spent around $40 buying toilet paper, ziplock bags, sponges,trash bags etc. there also wasn't any cleaner for the counter. I rent about 3 vacation homes a year and have never run into anything so stingy. The property managers were awful to deal with. Everything was unclear and emails weren't received for checking in process. I also had to give my credit card number over the phone to pay for the home and the next day I had random fraudulent charges. They need to have a secure form of accepting payment. We enjoyed most of our visit but would never stay here again. The place was beautiful and well maintained. It is very well located between the Rod and Reel Pier and The Anna Maria Pier. We enjoyed fishing in the bay. The neighborhood is quiet. We brought 2 bikes and rented some additional bikes from Beach Bums. We enjoyed biking daily in the neighborhood (very little traffic even during the July 4th week). We could easily walk to 3 or more restaurants. Bikes would make cars very optional. Sitting under the australian pines with a constant breeze off the bay was so pleasant, it was hard to motivate yourself to do anything. We saw dolphins every morning and every evening. The house itself is perfectly decorated. All furniture appears new. Beds are very comfortable. Kitchen was well stocked with real plates and glassware. We have been here for 3 weeks. New appliances. We have been here for 3 weeks. The washer and dryer, dish washer, refrigerator work well. Nice people to deal with. They were very responsive to emails. My only real negative is that I'm too young to retire and must return to work and have to leave this wonderful place. We just returned from our week in this beautiful house. We had 2 families in this house and it was a perfect set up. The layout is great and provided plenty of space. The location was fantastic. We went to the main beach every morning and then spent our afternoons in the water off the back of the house. We saw dolphins daily and our children loved seeing all of the ocean life right in our backyard. We rented 2 paddleboards from Beach Bums for the week and they got plenty of use. Beach Bums delivered them to our house and picked them back up at the end of the week. Everything here was so simple. Take out from the Rod & Reel pier is a must. This house is clean and very well decorated. We would go back to this house in a heartbeat.